TablesReady is a waitlist and reservations management app designed to help restaurants graduate from traditional reservation logbooks and waiting lists to a new and modern way of communicating with regular and walk-in diners and handling their reservations or requests for a table. It allows restaurant managers and owners to discover and maximize business opportunities while being able to eliminate the troubles and challenges that usually stem from conventional reservation practices and from diners who walk in without any reservation. Simply put, TablesReady enables restaurants to inform their diners of their reservation or notify walk-in customers of available tables via text messages. Thus, it makes waitlist and reservation management a breeze and at the same time, keeps the tables full sans the long waiting lines of diners. TablesReady makes it easy for your restaurant managers and staff to handle table reservations and manage walk-in clients as well as deal with long waiting lines. Actually, it shortens, if not eliminate, long waiting lines by harnessing the power of SMS. This waitlist and reservation management application easily addresses the usual challenges and difficulties faced by restaurants that still employ paper-based reservation books and waiting lists by going digital. Reservation details are entered into the system such as date, time, the name of the diner, and their contact details. The system automatically sends an SMS to the diner, notifying them of their reservation. It reduces the number of diners not showing up, thus helping restaurants keep their tables full and the increase their profits. No more forgotten reservations, diners not showing up, etc. The app is also a great tool to manage diners on the waiting list. Instead of waiting in line for hours, they can easily leave their contact details at the front desk staff and do other things instead. Once a table becomes available, TablesReady shoots them a text message informing them that a table is ready. No more opportunities missed. No grunting diners waiting in long lines outside your establishment. On top of all that, TablesReady lets you generate data reports to show important metrics like average wait times and wait time trends, which are quite helpful in improving and growing your business. What Problems Will TablesReady Solve? Still using pen & paper for your waitlist? Calling out names or manually dialing guests? Throwing away those sheets every night? You’re wasting valuable time tracking down customers, they’re probably clogging your entryway (leading to other potential customers balking at the line), and you lose all your valuable data. TablesReady allows customers to wait where they want, and you can notify them with the touch of a button. New customers will be able to get right to the host stand, and your hosts will be able to help them right away, instead of being occupied finding other guests. And best of all, you can analyze your data when the night’s over. Are you considering a new or replacement restaurant pager system to let guests know when their table or food is ready? The hardware investment is huge $1500 or more, and the cost of replacing a lost or broken pager is more than the cost of TablesReady service each month. And believe it, you’ll need to replace more than one per month. Plus, no customer wants to have to carry an additional device. Just reach them on the device they’re carrying already. 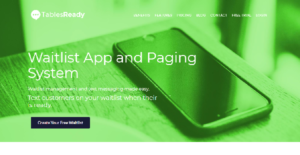 Their phone use TablesReady waitlist to text guests when table or food is ready. Are you a business owner like a barbershop or stylist that wants to have walk-ins be able to check themselves into your line? Just set up a tablet at your front desk pointed to our public waitlist. Customers can add themselves with their name, phone number, and optionally, the service they want. Then, when you’re ready for the next person, you just click a button to let them know to come back. If you are interested in TablesReady it could also be beneficial to analyze other subcategories of Best Restaurant Management Software listed in our base of B2B software reviews. Each enterprise has its own characteristics, and may need a special Restaurant Management Software solution that will be fit for their company size, type of clients and staff and even particular industry they support. You should not count on locating a perfect software that is going to be suitable for each company regardless of their history is. It may be a good idea to read a few TablesReady reviews first and even then you should pay attention to what the service is intended to do for your company and your staff. Do you need a simple and straightforward service with only basic features? Will you actually use the advanced functionalities needed by experts and big enterprises? Are there any specific features that are especially beneficial for the industry you work in? If you ask yourself these questions it is going to be much easier to locate a solid service that will fit your budget. How Much Does TablesReady Cost? We realize that when you make a decision to buy Restaurant Management Software it’s important not only to see how experts evaluate it in their reviews, but also to find out if the real people and companies that buy it are actually satisfied with the product. That’s why we’ve created our behavior-based Customer Satisfaction Algorithm™ that gathers customer reviews, comments and TablesReady reviews across a wide range of social media sites. The data is then presented in an easy to digest form showing how many people had positive and negative experience with TablesReady. With that information at hand you should be equipped to make an informed buying decision that you won’t regret. What are TablesReady pricing details? What integrations are available for TablesReady? If you need more information about TablesReady or you simply have a question let us know what you need and we’ll forward your request directly to the vendor.